Jill Filipovic: Al Franken's downfall isn't Kirsten Gillibrand's fault. The Democrats who think so are being sexist. Jill Filipovic Al Franken's downfall isn't Kirsten Gillibrand's fault. The Democrats who think so are being sexist. Blaming a woman for the consequences of a man's bad actions isn't a progressive liberal value. It’s tough out there for a female politician, especially one who advocates for women. Kirsten Gillibrand, the junior senator from New York, is reportedly facing blowback from donors who blame her for Sen. Al Franken’s resignation late last year. Franken stood accused of groping eight women, many of them Democrats, which he denies. 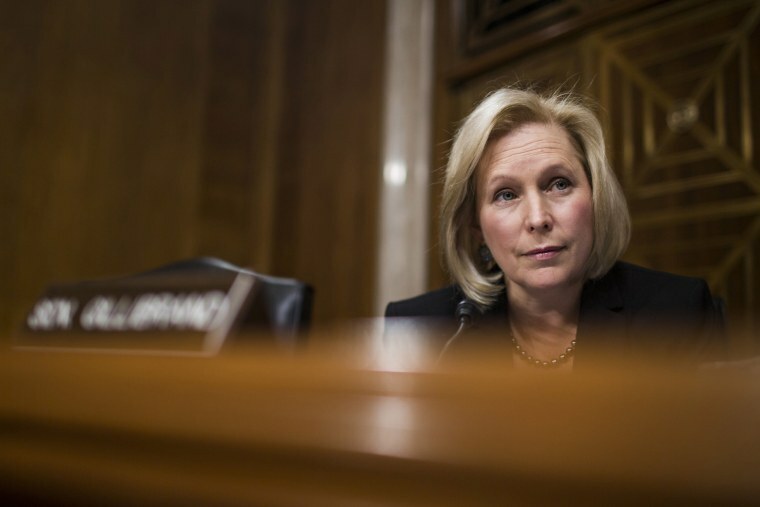 When the accusations came to light as part of the broader #MeToo movement holding powerful men accountable of their mistreatment of women, Gillibrand, who has been a leader in the Senate on issues of sexual assault and women’s rights, was the first Senate Democrat to call for Franken’s resignation. For that sin, scores of Democratic donors — many of them women — apparently won’t forgive her. But what was Gillibrand supposed to do? Context here is important: Sexual assault and harassment are two of her marquee issues, and she would have looked like (and been) a massive hypocrite if she had been willing to call out predation in the military and from the GOP, but not within her own party. Just as importantly, Republican Roy Moore was at the time running for the Senate from Alabama, despite being accused of child molestation and predatory behavior toward teenagers when he was in his 30s; the state GOP supported him nonetheless, and his candidacy was a major Democratic talking point to highlight the differences between the two parties. Many Democrats argue that Franken was forced to resign prematurely, and that he deserved both the benefit of the doubt and due process — perhaps a Congressional committee to evaluate the accusations and his behavior. And that’s fair enough. But imagine if Franken had stayed in his Senate seat: The accusations would have dogged him incessantly, and been an albatross for the whole party to bear. Democrats would have lost any moral authority they had on issues of sexual harassment and assault — and Gillibrand in particular would have been seen as hypocritical, insincere, cowardly and craven. When women break that expectation — say, by leading instead of collaborating — they often face professional consequences. Not that being ideologically and politically consistent on this issue helped her much. She may not be branded a hypocrite, but instead she’s tarred as something equally poisonous: An ambitious woman who puts her own objectives ahead of others. She’s apparently written off as insincere all the same for supporting victims of sexual assault and harassment when the accused was a Democrat. Women, after all, are supposed to be unconditional support systems and generous team players. We are supposed to cheerlead for others, share the credit, and foster cooperation and communication. This is one reason, we are told, that we need more women in government and at the highest levels of business: Not because it’s fundamentally fair to have our institutions reflect our population, but because women are nicer, more collaborative, and less self-interested, and therefore (maybe) better leaders. When women break that expectation — say, by leading instead of collaborating — they often face professional consequences. That was Gillibrand’s fundamental crime. It’s no surprise that some of her loudest critics are women. Women aren’t immune to internalized sexism, nor free from deep and nearly-invisible assumptions about how other women should behave — assumptions that unfairly color our perceptions of assertive or powerful women. But female Democrats who are critical of Gillibrand may feel freer to speak out about it than men, more inculcated as they are to accusations of misogyny. In truth, plenty of other senators joined the call for Franken to step down, and one imagines that he heeded it, at least in part, because he concluded it was necessary for the party to move forward. The narrative around Roy Moore would have been vastly different had Franken stayed in office; so would have been the narrative around Donald Trump. And the controversy wouldn’t have gone away by this year’s midterm elections. Still, it’s now a woman who is being held responsible for a man’s actions. Gillibrand is being called to answer for the consequences of Franken’s bad acts — demands that echo the never-ending demands that Hillary Clinton atone for her husband’s sins. Maybe Franken's a 'good' man. But he admitted sexual harassment. Gillibrand, like Hillary Clinton before her, also faces incessant questions about her political authenticity, and relentlessly battles the assumption that she’s a political moderate who performs progressivism and feminism to grasp at votes. It’s true that, when Gillibrand was a congresswoman representing a more conservative district in rural upstate New York, her voting record was moderately more conservative and more pro-gun than it has been since she’s been in the Senate. But since she was elected to her Senate seat, she’s been one of the chamber’s most progressive legislators. It seems just as plausible that she tamped down her genuine beliefs to serve as a fair, effective and representative congresswoman for her district than it is that she’s faking being a kind of feminist Bernie Sanders now. She certainly knew that Franken was beloved; it’s hard to imagine she thought she would be lauded for saying he should resign. More likely, she knew she would be accused of pushing him aside so she could clear the presidential field for herself. Because we still aren’t entirely used to seeing women in positions of power, and since we are so skeptical of those who reach the highest echelons, it’s easy to find something discomfiting about the ambitious women who rise to the top. For women in particular, it’s dangerous to be perceived as the kind of careerist who will take out a well-liked man in the process of clawing her way to the top. As much as the election of Donald Trump over Hillary Clinton cast a disturbingly bright light on the depth and persistence of American misogyny, the shrewification of Kirsten Gillibrand from both segments of the left and some moneyed Democrats shows just how much sexism isn’t a uniquely partisan problem – and how far Democrats have to go if we truly want women to have a shot in politics.